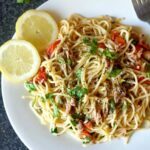 Quick Tuna Spaghetti, a fabulous dish that is ready in about 30 minutes. It might be simple to make, but it’s jam-packed with fantastic flavours. Low in calories, highly nutritious and delicious, this is a great family-favourite pasta recipe. 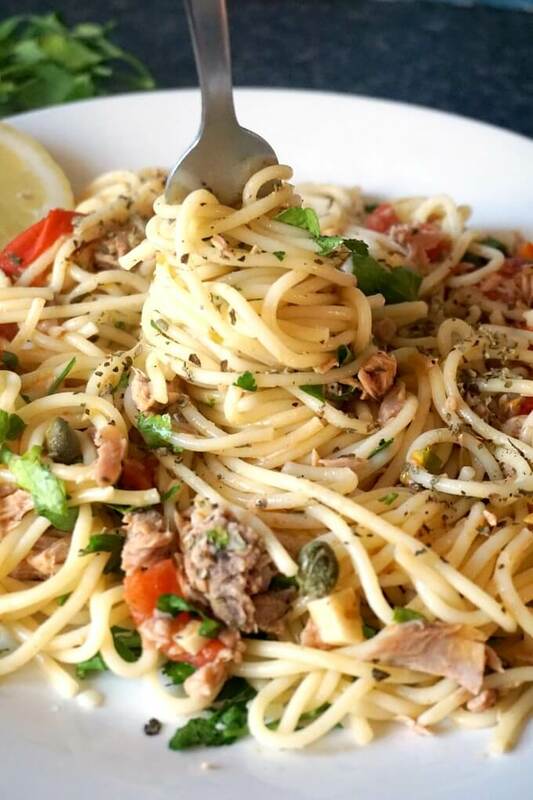 This awesome tuna spaghetti is inspired by Gennaro Contaldo’s mouth-watering Simple Tuna Bucatini, one of Italy’s finest pasta recipe. It’s the perfect example that you can cook pasta in thousand of ways, and still never get bored of it. Canned tuna, apart from being affordable, it’s also really tasty, and can totally transform a pretty simple dish into a spectacular one. Fresh fish can be dear, no doubt about that. And if you need to feed a larger family, one meal can become quite expensive. So, how about keeping costs low without compromising on taste? Pasta, the humble pasta is always to the rescue when we run out of ideas what else to cook for dinner. 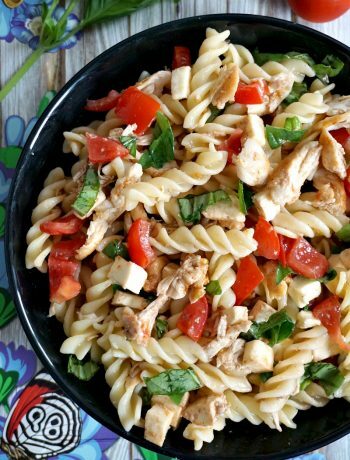 Now, pair tuna with pasta, and you get a dish that even fussy eaters will eat up. There are a few other ingredients that help enhance that Italian flavour of a old favourite, like anchovies and capers. You can get them from pretty much any store, and with one small jar of each, you can easily cook at least 4-5 times. So, again, we are talking about shopping the smart way. Another fabulous addition is fresh lemon juice. This really gives this tuna spaghetti dish that killer final touch. You can never go wrong with a bit of lemon in pasta dishes, especially when you don’t use the good old tomato juice. For these photos above you can tell what a pretty easy job you have. No complicated sauces, just throw the stuff in the pan, stir it a bit, throw in the cooked spaghetti, and that’s your job done. 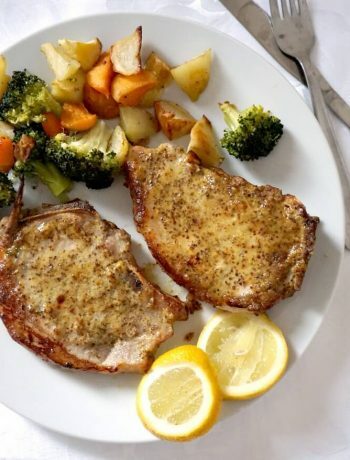 Your homemade dinner is ready, and it’s way tastier than any fancy restaurant recipe. 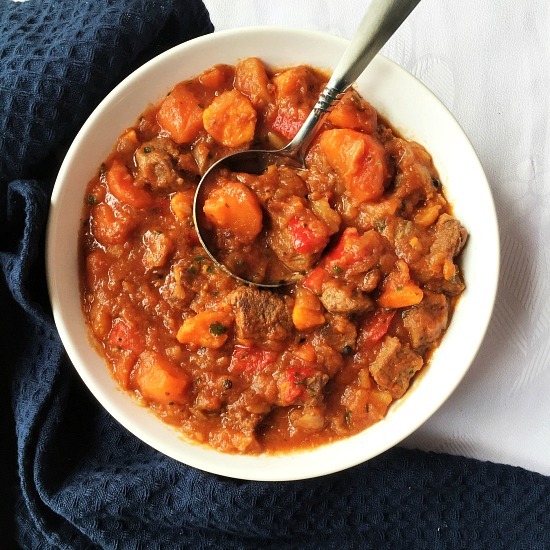 I used cherry tomatoes, but if you like to get a thicker sauce, you can use a tin of chopped tomatoes, and let them simmer until reduced by half. The fresh tomatoes, however, will bring that fresh touch I was after, and also a tad of sweetness to the dish. The chopped tomatoes tend to be a bit acidic, you can really tell the difference. By no mean, I have nothing against canned chopped tomatoes, I used them a lot in my everyday cooking. But some recipes can do with just a handful of fresh tomatoes, like this dish. And garlic, don’t forget about garlic. Be generous with it, it can only make the dish stand out even more. Tomatoes and garlic can only make a hell of a sauce, in any dish, not just pasta. To garnish, you can either go for fresh parsley, like I did, or fresh basil, or a combination of the two. Apart from that spash of colour, the fresh herbs will will bring that wow factor to an already perfect dinner. Only 122 calories per serving, what a treat! 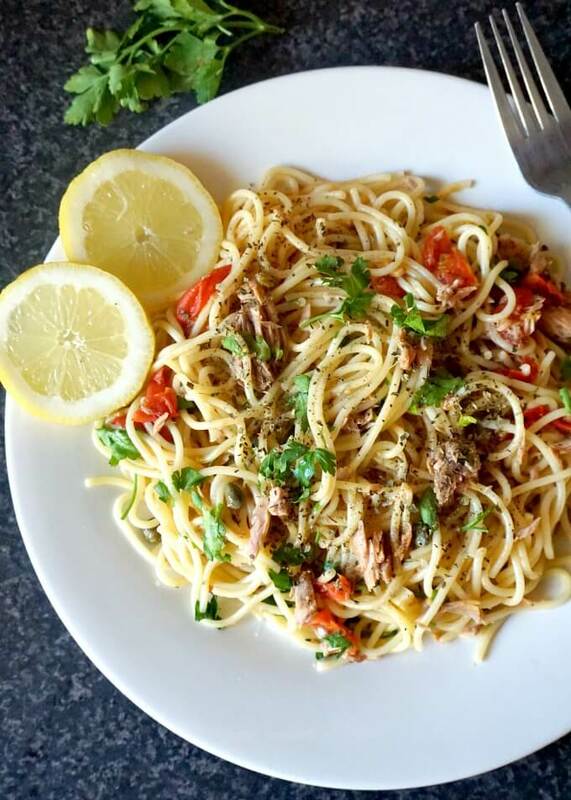 If you’ve liked my QUICK TUNA SPAGHETTI or any other recipe on the blog then don’t forget to rate the recipe and let me know how you got on in the comments below, I love hearing from you! You can also FOLLOW ME on FACEBOOK, and PINTEREST to see more delicious food and what I’m getting up to. Quick Tuna Spaghetti, a fabulous dish that is ready in about 30 minutes. It might be simple to make, but it's jam-packed with fantastic flavours. A family-favourite pasta recipe. Heat up the oil in a pan, then chop the garlic and achovy fillets and add them to the pan. Cook the garlic and anchovy for about 30 seconds, the anchovy will completely melt away. 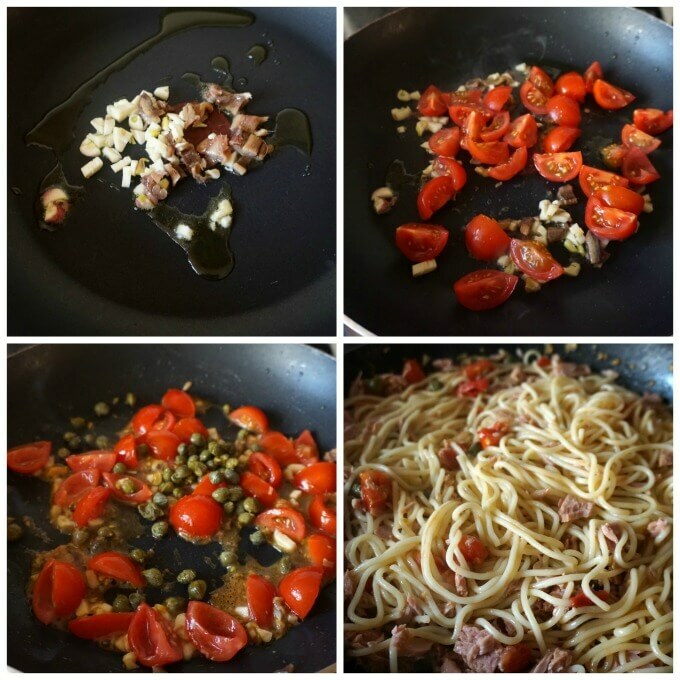 Chop the cherry tomatoes, and add them to the pan together with the capers. Leave to cook until the tomatoes will become mushy, that should not take longer than 4-5 minutes. Toss in the pasta, lemon juice, flaked tuna, Italian herbs and parsley, give it a good stir, and remove from the heat.